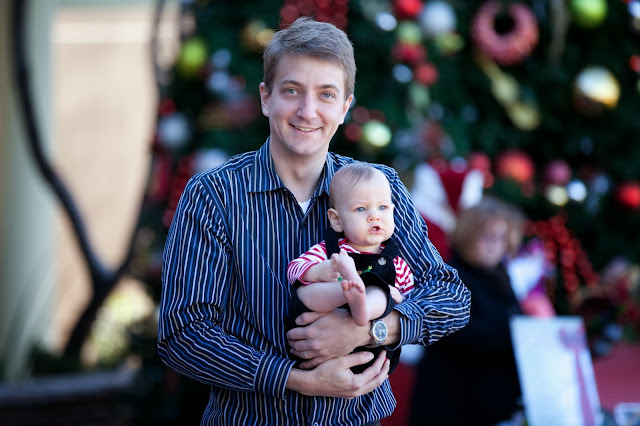 Last weekend we set out for Parker to meet Santa for the first time! I had done my research, and while there were a ton of different places to do this, most of the set-ups had strict no-outside-camera policies (encouraging you to instead purchase bigger packages of printed photos from them). Some of my mom friends said that this meant they ended up with pictures of their little ones with their eyes closed, or heads turned. Since we own a nice DSLR, we really wanted the option to snap some of our own photos. 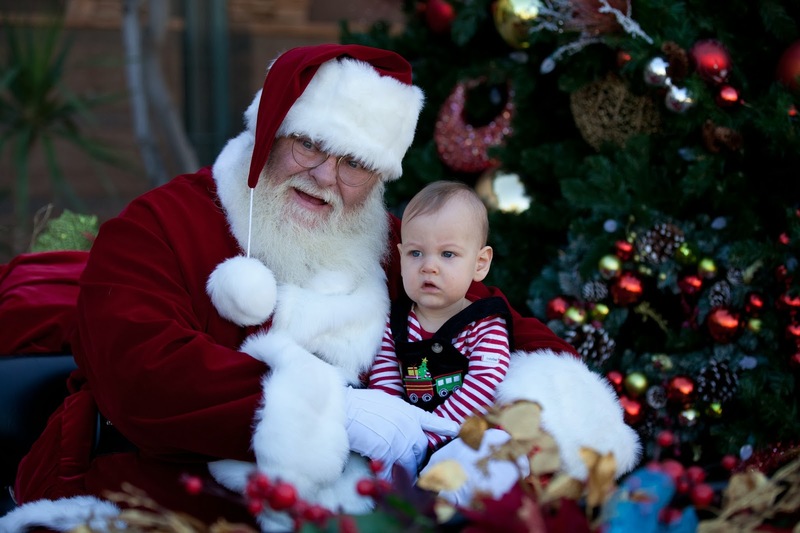 We finally discovered (via a mailed brochure) that Santa would be making a cameo at the Scottsdale Promenade (just 15 minutes from our house), and he would be offering complimentary pictures with him! Bingo! If the photos were complimentary, I figured there would be no problem snapping some of our own! We headed out on Saturday after Parker's morning nap. We were excited to discover a bagpipe player near Santa! While we (Max) ended up snapping a ton of pictures, this is probably the best that we got. Parker's eyes aren't closed, but he definitely looks concerned, hah! Actually, sitting on Santa's lap didn't phase him - he was way more interested in looking at the horse and carriage that was rolling by. As for his list to Santa, we are lucky that little man cannot talk yet because most of these items would definitely be on there, including laptop cords to chew on, mom and dad's house keys, and a wall mounted entertainment center (toilet paper roll). Fortunately, mom and dad get to make Parker's list this year, which will include wooden puzzles and board books. So long until next year, Santa!